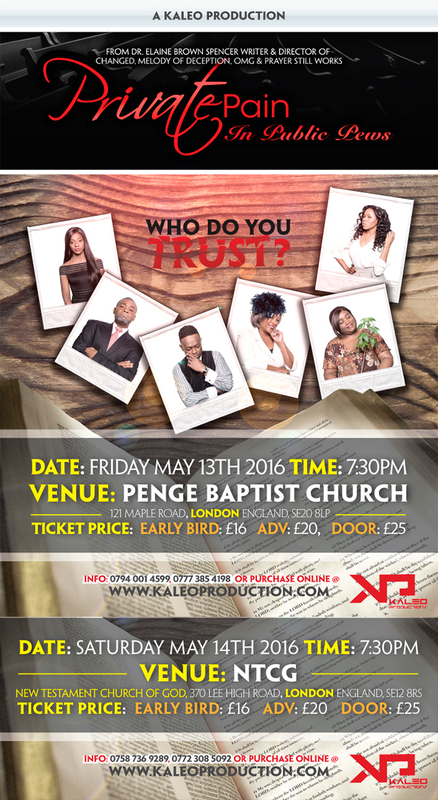 Private Pain in Public Pews: “Trust God” by Dr Elaine Spencer is coming to London on May 14, 2016 giving more people the chance to see her timeless original stage play that her theatre audiences have fully embraced. Kaleo Productions is storming theatre audiences across Canada, Jamaica, UK and Cayman Islands with gospel stage plays (Melody of Deception) written, directed and produced by international playwright Dr Elaine Brown Spencer. Beautifully written and emotionally captivating, Private Pain in Public Pews addresses what we all know has gone on in the church, but we’re too afraid to talk about,” says Spencer. “It’s dramatic, thought provoking and funny. A bit of humour makes difficult issues much easier to talk about”. The play deals with church secrets and the private lives that hold them. It’s no secret the Christian church has been experiencing a period of turbulence. From the pulpit to the pew, leaders and everyday people are falling from their pedestals with scandals of infidelity, double lives and money obsessions. But the real secrets are embedded in the stories of pain behind these scandals. And that’s where this theatrical stage play, Private Pain in Public Pews comes in. Adapted from Dr. Spencer’s popular book Private Pain In Public Pews, the story focuses on Minister Terry and his wife Lydia who are admired by the congregation. But their picture perfect image is threatened when Terry’s old flame Tia, weasels her way back into his life. Terry tries hard to run from his past but ends up hitting a brick wall. Private Pain in Public Pews will give you a lot to think and laugh about. It’s a play that crosses all boundaries of traditional gospel theatre. It’s real, honest, and heartfelt. Don’t miss your chance to experience the show that will keep you on the edge of your seats.